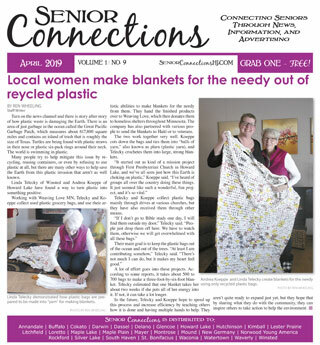 Senior Connections welcomes submitted items of any kind that may be appropriate for our readership. Use the “Submit” form at our website, or contact us at info@SeniorConnectionsHJ.com. Ad deadline is the 10th of each month for the next issue. To be included, please contact any of our sales representatives, or call us 320-485-2535.
. . . plus email distribution to the complete online version – sign up at the top of our Homepage to be notified when the next issue is available! Published monthly – look for each issue a few days before the beginning of each month.